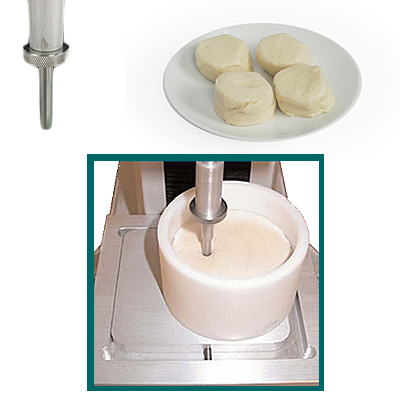 The Flour Milling and Baking Research Association (FMBRA) dough pots kit is designed to test the firmness of bakery mixtures. 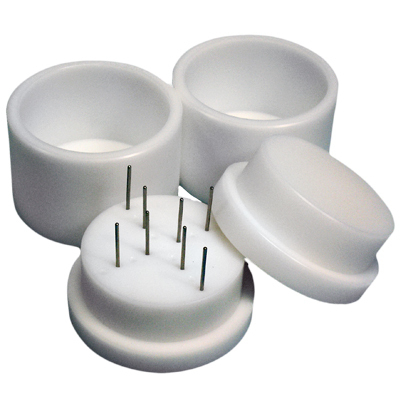 The accessory is used to both prepare and present the sample in a consistent manner for compression/penetration testing. A known weight of sample is placed in the pot and the aeration plunger - incorporating eight pins - is fitted and rotated, removing air pockets which can affect the force reading. The second lid has a flat surface for compacting the sample. The dough is analyzed for firmness using the supplied 6 mm diameter probe to compress and penetrate the sample within the pot. For controlled preparation of soft biscuit dough. Includes aerator and compressing plunger as well as a 6mm diameter probe for penetration testing.